When running a boarding cattery business most of your clients will pay by cheque. You will need a business cheque account with your bank to enable you to pay the cheques into your business account. Your bank will make a charge for cheque accounts and cheque cashing, you should find out exactly what charges you will be faced with. 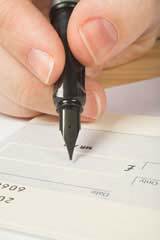 If your bank charges for each cheque deposited, over the course of a year this could add up to a significant amount. Perhaps you will be charged for each time you deposit a batch of cheques, in which case it would be wise to bank as infrequently as prudent. Naturally you will want to get the cheques into your account, but be aware of the costs involved. Most banks will make a charge for each transaction that takes place and they will supply you with a tariff. If you have a very small business, perhaps you will be able to negotiate a figure. When a client pays their account by cheque you will need to record it. Firstly on your booking forms you should have a place to record how a bill has been paid e.g. cash, cheque or credit card. The booking forms that state that a payment has been made by cheque should be kept in date order with the cheque until you have time to write up your banking-in book. Most business banking books have adequate space for you to write the name of the client alongside the cheque amount. If you (for convenience) opt to use the quick paying in envelopes that most banks provide, you will need to record the clients name, and the amount paid elsewhere. There are many suitable books on the market which will enable you to record all transactions. Even if you do record names on the paying in slip, it might be prudent to keep a separate record. This will enable you to give the book to your accountant when necessary. Your book will also enable you to keep a running total of your banking quite easily. Whatever money in the way of cheques or cash that passes through your business can be paid into the same account. You will need to have a cheque book to pay your cattery bills with, and if you wish you can set up your business direct debits. You might have a separate personal account where you could pay yourself a wage from the cattery takings. All records of payments made, cheque cashing, bills paid etc. must be kept for a minimum of six years. Once you have banked the cheques, you should record the total amount banked, with the date on which it was banked and store this with the batch of cattery booking-in forms that the payments refer to. If there are ever any queries as to dates or amounts you will have an easy reference. Although you might have a good retentive memory it can be amazing as to how often when asked a question about your finances you will find it necessary to refer to your documentation.